Rheumatoid arthritis (RA) is a chronic condition causing inflammation in multiple joints. People with this condition experience pain and stiffness of the joints. 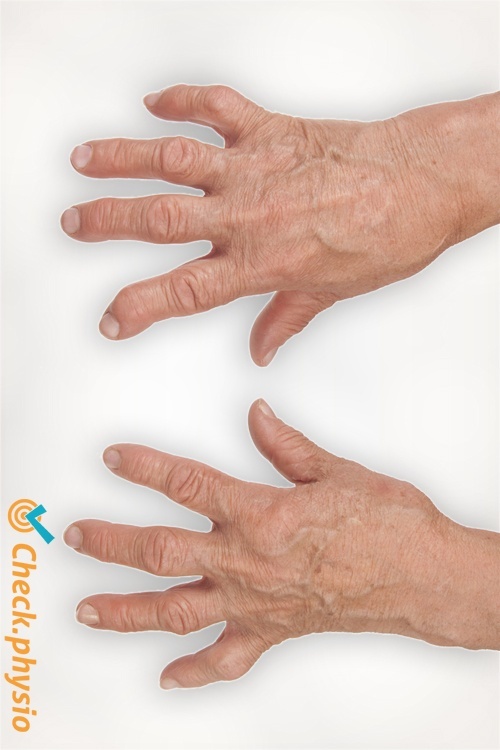 The symptoms are often located left and right in the same joints and often start in the fingers and toes. It is not known why a person develops rheumatoid arthritis. It can occur at any age. Women have a higher risk of developing rheumatoid arthritis than men. Rheumatoid arthritis is an autoimmune disease. This means that the body produces antibodies against itself, in this case against the tissue on the inside of the joint. The antibodies cause inflammation that can damage the joints. A lot of research has been performed on rheumatoid arthritis. Unfortunately the exact cause is not yet known. The immune system probably becomes disrupted as a result of a number of factors, such as genetic predisposition and smoking. The main characteristics include pain, stiffness and swelling in the joints, for example the hands, wrists, ankles or feet. Symptoms can also occur in other joints such as the hips, knees and shoulders. Inflammation causes the joints to become warm and swollen. A red discolouration can also occur. The symptoms are present both at rest and in motion. The stiffness occurs primarily in the morning, or after the patient has been sitting or lying down in one position for a while. The stiffness can last from half an hour to several hours. Swelling can occur in the skin as a result of the inflammation. This usually affects the elbow or the forearm. This subcutaneous swelling is referred to as rheumatoid nodules. Without treatment, the patient is at risk of the joints becoming deformed in the long run. 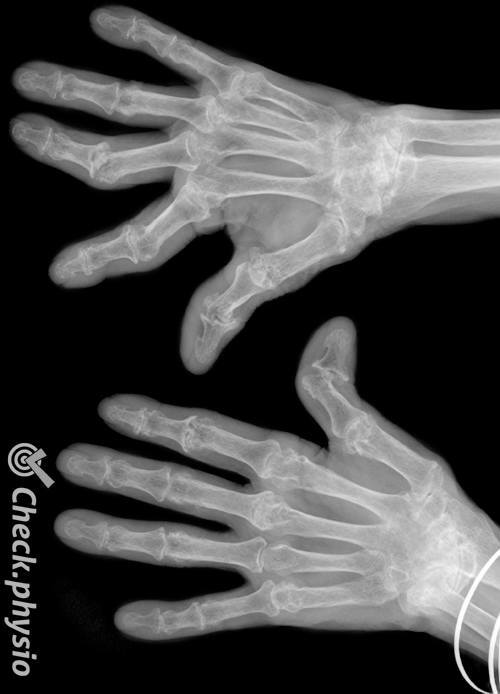 For example, bone growth can cause thick nodules to form in the joints of the hands. The patient can suffer fatigue. If the rheumatoid arthritis flares up badly, the patient can feel ill and feverish. Anaemia and weight loss can also occur. The diagnosis is made based on the patient's story and the physical examination. A blood test will also be performed to support the physical examination. If the joint inflammation has existed for more than 6 weeks and the joints are stiff in the morning (and after rest), this increases the chances of it being rheumatoid arthritis. The patient will receive medication and will often also be guided by a physiotherapist. The aim is to keep the joints supple and improve physical condition. Quitting smoking has a favourable effect on the course of rheumatoid arthritis.